Woooohee! As I grabbed the top of the windshield and trapezed down into the cavern of flatback metal consoles and ominous white lettered placards, my mind tripped off into a euphoria of nostalgia. As I strapped on the YT-35 Buckaroo. my thoughts were a tangled montage of the sounds of Glenn Miller and Pratt & Whitneys, of the croonings of a young Frank Sinatra and the barking of .50 caliber Brownings. I doubt if my reactions to the Buckaroo are unique. It's an airplane guaranteed to reach inside your soul to touch the unfulfilled fighter pilot that lives within us all. To put the Buckaroo into proper historical perspective, I probably should have been having visions of F-80s and F-86s, because that's the aeronautical period of the Buckaroo. It was 1948 and Temco's boss was casting about for new markets. Just a year or so earlier, they had bought the manufacturing rights to the Globe Swift, a two-place, low-wing bullet that reflected all the technological advances the war had brought into the light aircraft field. While markets were being researched, the Philippine government approached Temco about building trainers for their embryonic air force. 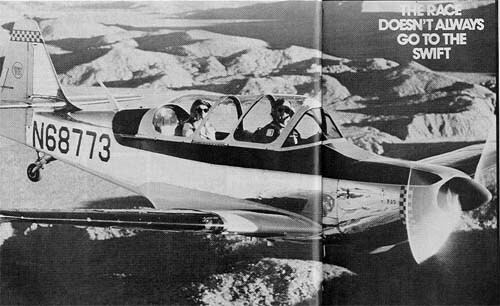 The decision was made: Temco would build a trainer based on their current product, the Swift, changing it only to incorporate tandem seating, stick controls and a military-style greenhouse canopy. Now is the time to bust a few legends and correct a few rumors. Many aviation milquetoasts of the 1970s have never seen or heard of the Buckaroo, and that's their loss. But those who are familiar with the minifighter from Texas often have the mistaken idea that the Buckaroo, as tested by the USAF and as delivered to various foreign governments, was built mostly of Swift components. 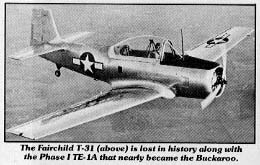 The confusion began because Temco produced two completely different airplanes that were designated TE-IA (YT-35 Buckaroo was the USAF designation and applied only to the later TE-IBs tested). The two airplanes were referred to as Phase I and Phase II TE-lAs, and the design philosophy behind each was distinctly different. The initial design work was aimed at producing an extremely low-cost trainer for commercial and export markets that would use as much existing Swift tooling as possible. And it became known as the Phase I airplane. It was a Swift from its rounded wing tips to its boxy fuselage. The top of the fuselage was faired inward where the window rails used to be, and a rather bulbous greenhouse canopy was built with tandem seating for the pilots. The rudder was squared off and enlarged both to change the appearance and give a little more effective area. 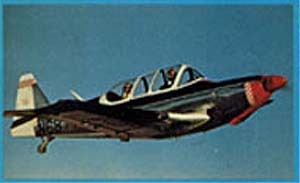 In 1949, Phase I TE-lA was hurried to completion for an Air Force fly-off competition at Wright Field agains t the Fairchild T-31 and the Beech T-34. 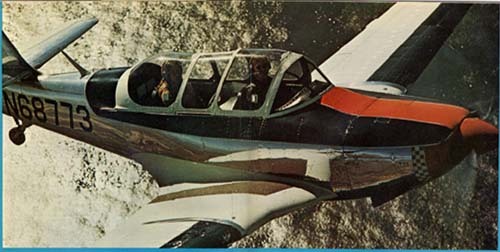 The winner of that competidon was the Fairchild T-31-a fact that's lost in history, right along with the T-31. Apparently, the jury-rigged appearance of the original TE-lA left a few Air Force evaluators shaking their heads, so the Temco team started cleaning up the design and generally working it into a more sophisticated aircraft. The deeper they got into changing things, the clearer it became that the Swift-oriented design wasn't going to hack it. Making the airplane attractive to foreign governments would require too many changes, so the Phase I TE-IA was shelved after several prototypes were built. 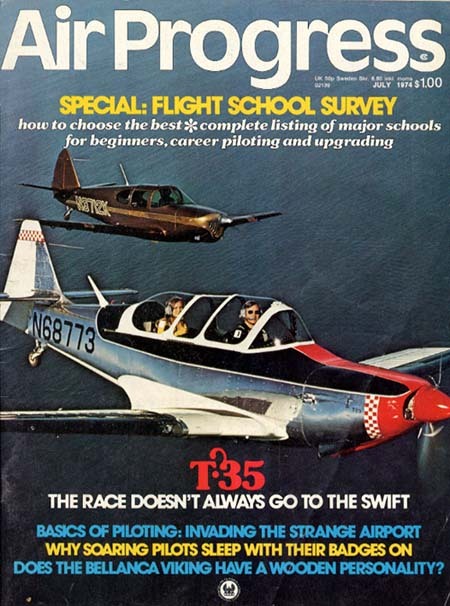 Temco knew they had a good thing in the original TE-IA, but rather than continue the never-ending modifications, they started with a clean sheet and designed a completely new airplane using only the Swift's size and basic shape. The Phase II TE-IA began as a plaster mock-up and developed into a fuselage that had a firewall the same size and shape as the Swift's, but was slightly longer and flowed more smoothly to the tail, providing more room for the rear passenger. It was still two people wide at the firewall. The center section was modified to incorporate fairings that allowed the gear to retract flush. The gear itself was modified and relocated. The outer wing panels were beefed up to give an ultimate loading capability of 9 Gs. The wing tips were extended and squared off to give a little more area and make them a bit more effective. The cowling and engine compartment remained all Swift on initial production Phase II airplanes, but even they were changed during tests at Wright Field. As finally submitted to the USAF for testing, the only part of the TE-IA/YT-35 Buckaroo that was built on Swift tooling was the wing slot. Even the 145-hp Continental the TE-lAs inherited from the Swift was replaced with a 165-hp Franklin and an aeromatic prop. The engine change prompted a new designation: TE-iB. One Buckaroo design feature that is definitely not going to find its way into your everyday Swift is a matched pair of .30 caliber machine guns, one in each wing. Eventually, these hull thumpers were joined by hardpoints and zero-length rails for ten 2.75-inch I-WAR rockets. This took the Buckaroo out of the toy-trainer category. It seems the dream of every small airplane manufacturer is to produce a tiny airplane bristling with armament that will win the hearts of the military and give the manufacturer a fat contract and an ego-boosting attack bomber production line. The 1950s were full of this dreamlike design work. Of the attempts at armed trainers, only the T-28D and Cessna's arming of the T-37 to make it an A-37 have borne any fruit. The idea was to provide an economical means of eliminating small targets (tanks and the like), but the military has always turned its head, preferring its philosophy of unencumbered overkill. With the USAF order lost, Temco had to depend upon foreign governments to keep the production lines lines rolling, but the business didn't materialize. Although figures vary according to the information source, it appears the total number of TE-1/YT-35s produced didn't top 20: two prototypes, three service test aircraft for the USAF (true YT-35s), 10 (some sources say as high as 17) for Saudi Arabia, and one each for Israel and Italy. Only three YT-35s and One Phase I TE-lA aircraft have survived. As I settled into the cockpit and inhaled the military aura of Buckaroo N-68773, I didn't know whether to curse the Air Force, or envy the airplane's lucky owner, Len Lundmark. Lundmark is a charter member of the Southern California cult of the enthusiastic and successful. Businessman, pilot entrepreneur; name it he's good at it. He's also one of the most accommodating, affable people you'll ever meet. He managed to pry his Buckaroo away from its former owner several years ago and has since spent his enthusiasm and skill making it an outstanding representative of the breed. Until he bought it, this particular Buckaroo had lived only a few yards from the only other flying Buckaroo. That one was owned by John Crowly of Van Nuys, California. Crowly had installed a 210-hp Continental in place of the feeble 165-hp Franklin, but was still not satisfied, so he upgraded again to a turbocharged Continental. That meant there was a 210 Continental and mount for a Buckaroo for sale. Since Lundmark's airplane still had the 165 Franklin, he jumped at it and had the engine majored before hanging it in his airplane. There is a rumor floating around Southern California that Saint Peter personally watches over his favorite airplane, the Buckaroo. It was started when the former owner of Lundmark's Buckaroo shed a propeller blade while doing aerobatics nearly 20 miles off the coast. Not only did Saint Pete reach in and keep the engine from shaking itself out of the mounts, but he helped the Buckaroo glide all the way to shore and directed Saturday afternoon traffic while it landed on Santa Monica beach without getting a scratch or harming a soul. Lundmark bases his airplane, his real estate business, his Swift modification parts company (Swift Tech makes Buckaroo tips, all Corben mods, etc.) and other ventures at Gillespie Field in El Cajon, California, and that's where I caught up with him. I'll have to admit I was a bit overwhelmed by his hospitality and efficiency. By the time I arrived he had arranged for a camera plane, a formation pilot transportation aircraft and lots of bright sunshine. I'm still wondering how he managed the smog-free day. Aside from the go-get-'em look and smell of the cockpit. the first thing that strikes you when strapping in is the extraordinary distance between the rudder pedals. As in most cannon-toting aircraft, you have to spread your legs wide, gun-fighter style, on either side of the control stick, but the Buckkaroo puts your feet further apart than most. True to custom, the cockpit is arranged exactly like those of most American military aircraft. Electrical systems are on the console on the right, and gear, flap and trim controls festoon the console under your left hand. The quadrant type throttle feels like business and lacks only the gunsight twistgrip of the P-51 to complete the image. In fact, the Buckaroo often mentions the P-51 as the standard used for designing the cockpit and general flight characteristics. And what flight characteristics! The several hours I spent flopping around in the Buckaroo are a blur. The California landscape went up and down as I frolicked around in the front pit while Chuck Lischer, one of Lundmark's aerobatics oriented friends, rode in the back. As expected, the Buckaroo turned out to be a low buck, high adrenalin trip into the world of unlimited performance and flight. It's not blindingly fast about 150 mph indicated, but all the speed in the world couldn't give the little jabs of pleasure you feel while whipping around the sky discovering what the airplane will do. The ailerons are smooth and quick, with a response so immediate that it feels as if the stick is connected directly to the entire airplane. They are light but air pressure feeds flight loads in through the wings, filling the stick with bits of information about speed and roll rates. It lets you know by feel whether you're going to have enough speed to complete that vertical roll or whether you're fast enough to roll out on the back side of a Cuban eight. The ailerons are so inviting and satisfying that it's not necessary to slow roll your mind to enjoy them, although that's not bad either. The way the airplane answers your hand in normal, everyday pattern flying is enough to make you want to mortgage your house and pawn your kids to get one. The overall control harmony is possibly the best of any aircraft I've flown, with the exception of the Bearcat. Only the rudder shows any weakness, and then only in high negative-C aerobatics. The stalls are exactly what you'd expect from a micromilitary machine. Chuck and I stalled going straight up, down and sideways, and it always behaved the same. The wings would unload with only a slight warning buffet, then it would try to fall off on a wing, usually the left. In doing vertical rolls, I ran out of steam a couple of times just as I finished the roll, and the airplane stalled while still vertical. It started falling, but I easily controlled the wing attitude and the speed with which the nose fell through, recovering in soggy, but still level, flight. The slots in the wings must really work because I always had plenty of aileron regardless of speed. It's hard to tell a pilot who's flown only Wichita wonders how something like the Buckaroo flies the landing approach. Such airplanes seem to fly the pattern with little or no help from the pilot, but what actually happens is that the pilot doesn't have to fight the airplane. He has absolute control at all times. Most airplanes can't be controlled that way. If the Buckaroo drops a wing in a thermal, the correction is an unconscious twist of the wrist, not a forceful twist of the control wheel. If the speed wanders off the correct number, a minute movement of the control stick corrects it. The old cliche about the "man is part of the airplane" rings true when an airplane presents as few barriers as possible between the thoughts of the man and the movement of the machine. 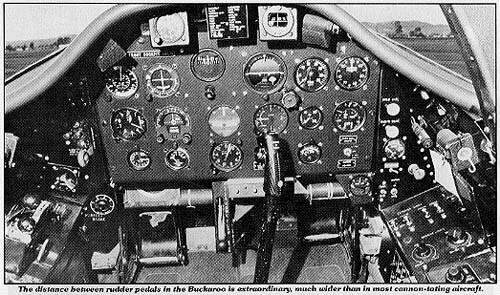 Few airplanes have this delicate balance of control harmony and aircraft design, but those that do, like the Buckaroo, are considered the standards by which others are judged. As I dirtied the airplane up on final, I had no doubt that the airplane was at least as honest on the ground as it was in the air. And the Buckaroo didn't let me down. If anything, I let it down-hard! The airplane's warbird image is so complete that I made several landings a foot or two in the air because I couldn't believe the nose didn't have to be pulled up to cover the runway like a real fighter. Just the opposite was true. In a three-point attitude on the runway, you sit so high you can see over the nose, and you have a tendency to overflare and land high. But even the bad landings ended in a straight-as-a-pool-cue rollouts. The slight change in geometry from the Swift landing gear produced ground-handling characteristics that approach tricycle gear for stability. Incidentally, like the high-performance birds, the Buckaroo was meant to train pilots to fly. It won't let you hang in the air indefinitely while searching for the ground. When it decides it's done flying, it doesn't say a word. It drops straight down without even wiggling a wing. So holding it off too long, too high, could shake the caps off your teeth on impact. Post Script from the Year 2000: Don't go looking for the Arabian Buckaroos. Charley Nelson and his Swiftites salvaged as much of the airframe scrap as they could and assembled two plus airframes, one of which belongs to the Arabian government.